Saturday was a good day to be in Courmayeur. A quick nip through the tunnel for better snow is super easy with the Val Veny cable car only 3 minutes from the Italian entrance. 20 minutes later we were skiing groomed pistes with 25cms of fresh snow. This was Chris’s first ski of the season so he was over the moon with the conditions – fresh snow, if a little bit heavy. After lunch, we lapped the black behind the Baby Bowl and then the trees down to Zerotta. 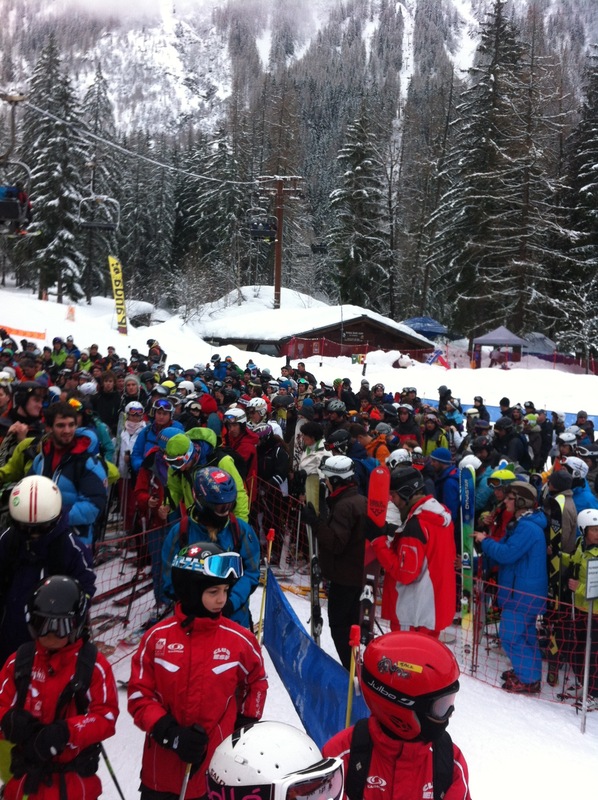 Check out the number of lifts and runs open in Courmayeur at the moment. K2 Coombacks performed well, they’re proving to be a good choice. Having spent three years on full rockers, it’s nice to feel an improvement on the piste. Yesterday morning was the first real frost of the winter at -2°c in Les Houches. The same time last year, we were all outside in t-shirts. The peaks all around were covered in snow. This morning, it’s a little bit different. Positive temperatures, definite differences between the south facing slopes such as Aiguillete des Houches and Le Brévent where the snow’s melted and the north facing slopes. With the sun arriving up there too, I think there’ll be even less by the end of the day. No more snow is on the horizon for the time being either. Check out the Chamonix webcams to see what it’s like at the moment. Have a look at the Grands Montets, or Le Tour, two popular places to compare with your memories!It doesn’t look much more than Derbyshire in deepest winter so far, but let’s not forget it’s only mid October. Should we be excited about this as it’s so early??? Absolutely! We’re off to Tignes next week (to try our new K2 skis that have just arrived) where apparently the glacier has redeemed itself after a hot summer and the snow’s now in good condition up high. Keep an eye on the pistes and the state of the snow with the choice of Chamonix webcams throughout the winter. Start the fitness campaign, book your flights, tighten your bindings. See you in Cham this winter.